What’s up with this pacing Swan? A 70 year old woman has been in ICU for a week after a car collided with her scooter, resulting in isolated chest injuries. She appeared ready for the ward but has since markedly deteriorated due to urosepsis. 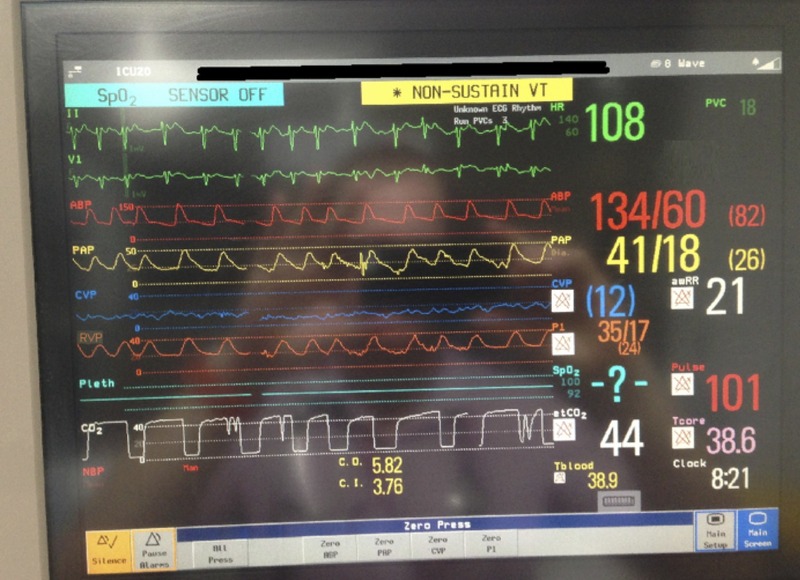 Now the patient has a spontaneous rhythm of 100/min and the ICU nurse reports that the pacing wire is not sensing. Q1. What are the key abnormalities shown on the monitor? The right ventricular pressure (RVP) and pulmonary artery pressure (PAP) waveforms are remarkably similar, as are the systolic, diastolic and mean pressures of each. The mean and diastolic RVPs are higher than the central venous pressure (CVP). Q2. Which of the waveforms mentioned in Q1 is truly abnormal and why? Except for showing values consistent with mild-moderate pulmonary hypertension, the PAP waveform is normal and so is the CVP trace. Q3. What investigation will help confirm the cause of the problem? A CXR is an easy way to confirm the position of lines. It showed that the pulmonary artery cather was looped in the right heart and was inserted too far into the pulmonary artery. This meant that the RV pressure transducer was also in the pulmonary artery – hence its pressures and waveforms are abnormal and it was no longer pacing/sensing. Another way to differentiate RV from PA pressure trace is the slope of the pressure curve during diastole. It slopes up during diastole in the RV and slopes down in the PA.